Ensuring Americans living in poverty or rural areas, who lack monetary means, are able to travel to distant medical specialists for life-saving care and treatment. Angel Canines and Wounded Warriors (Mercy Medical Angels) partners with several organizations that provide service dogs for veterans, clinical treatment for ill or injured veterans and specialized medical treatment for veterans suffering from PTS/TBI. Angel Canines and Wounded Warriors (Mercy Medical Angels) links the veteran with specialized, life-saving services by providing FREE medical transportation on the ground and in the air nationwide. Whether suffering from PTS, mobility disorders, blindness, loss of hearing, amputations, or an illness or disease that makes it difficult to manage day-to-day living, our nation's veterans can count on us to provide free air transportation to a vetted service dog facility. "Thank you for helping me by flying me and my service dog to required training. 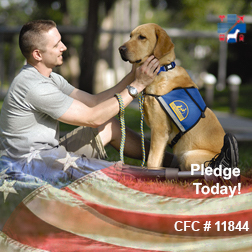 Without your help and assistance it would have been a great hardship for me to even have a service dog." "I am an Iraqi Vet, injured in South Baghdad, in 2005. I've had 24 surgeries to be able to walk again. Angel Canines and Wounded Warriors has been such an amazing organization to my wife and I. We have had to go back and forth to Brooke Army Medical Center (BAMC) in Texas for medical reasons, and have NOT had to be concerned with transportation from San Diego to BAMC. It is a huge stress relief. Without Angel Canines and Wounded Warriors support, these trips would be out of our financial reach, therefore not allowing me to receive the proper care needed." These statements of thanks spur us on! Please join us as we strive harder to give back to our veteran service men and women and those in need. Help remove barriers and increase access to medical care. Mercy Medical Angels provides FREE transportation nationwide to and from medical care for qualifying individuals and their families and your support matters. Each dollar we receive directly benefits someone in need of life saving medical care, a veteran, a child, a cancer patient or someone with limited means and abilities. Visit our website and pledge your support today!